Frangipani SUP07597 094233work PaddleboardingFrangipani SUP is a friendly, family run mobile Stand Up Paddle board school based in Maldon, on the Blackwater Estuary in Essex. We can teach you how to stand up on a paddle board for the very first time and get paddling and then we can help you to improve. We teach beginners at the Trifarm Ltd triathlon swimming lake in Boreham, near Chelmsford and on the beautiful and tranquil River Chelmer, which forms part of the Chelmer and Blackwater Navigation, running from Chelmsford to Heybridge Basin in Essex. We are proud to be a recognised British Stand Up Paddle Association (BSUPA) paddle board school, the first registered SUPfit provider in Essex and we take safety very seriously. We will provide you with all the equipment and clothing that you will need to learn to paddle and to progress and we can also help you source SUP equipment for purchase. We provide different levels of instruction including; Stand Up & Paddle for beginners, Stand Up & Progress for those who want to practice and improve, Stand Up & Explore for little excursions, Family Group Paddle for paddling with your children, SUP Senoritas weekday ladies' paddles, Team Paddles for small corporate teams and SUPfit classes for strength and flexibility exercises on tethered boards. Frangipani SUP is a friendly, family run mobile Stand Up Paddle board school based in Maldon, on the Blackwater Estuary in Essex. When you have mastered the paddling basics you will receive your BSUPA Ready to Ride Certificate and an invitation to join our Frangipani SUP HUB, a membership scheme for regular social paddling even if you do not own your own board. We provide and transport the boards and kit for HUB paddlers who don't have their own and we work hard to help everyone to develop their paddling skills, explore further, paddle faster or just have some fun time on the water with others. 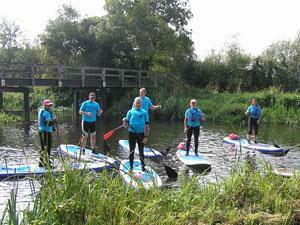 We paddle in various locations in the Maldon and Chelmsford area.